What’s the really good word, interwebbers? 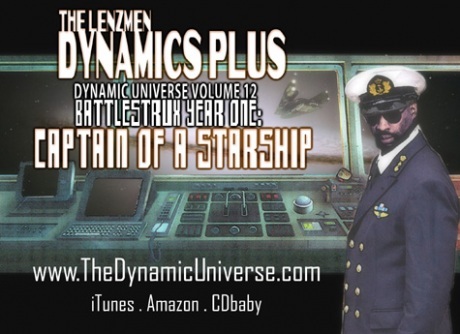 Today is an Artist/Band album review of a group I already reviewed an album for, but this is their newest (from what I know; they have a massive amount of released music you can check out at their Official Lenzmen Website) album titled Battlestrux Year One: Captain of a Starship. A briefing about this group would be difficult to sum up in little words because they’re that nasty. It’s actually completely confusing listening tracks from the Lenzmen due to the fact that there’s so much information to comprehend and compute in such a relatively short amount of time that the part, or the entire track, needs to be listened to another time. I actually listened to Battlestrux Year One: Captain of a Starship two times within two hours; it is that good. There’s a constant switch between cringing and being awed to the point of feeling intimidated. It’s the rush of visiting a former version of yourself and taking in what you used to be. Think about any piece of art to be a snapshot of the artist. A photo album is the same as a music album containing songs that mark different viewpoints, lifestyles and artistic sensibilities. Beyond the general decisions that are relevant in any musical context, there’s a much larger picture for a music group. A lot of what I hear is tied to what I thinking and feeling while these songs were being made. If you can imagine that perfect song that captures the mood of a summer or a movie that resonates or any experience that is etched into your mind and attached to a timeline. This album is certainly that for me. The album signifies the point the Lenzmen became and rap group and I became a producer. Before this, we were a bunch of lyricists recording together. You can still hear each Lenzmen burning down their verses, but there’s camaraderie behind each performance that didn’t exist before. We were single-minded. Each song stood alone and we believed any song that ‘went first’ would determine what we were in the minds of our audience. Therefore we couldn’t agree on any songs being worthy of being released first since everyone was concerned on how much they shined. We had a terrible system of each person writing on their own and showing up to record whatever they had. This led to odd-man-out songs, where there’s a verse that didn’t gel with the others. It wasn’t that the verse/delivery wasn’t great on its own- it’s just that similar verses point the song in a certain direction and a verse going someplace different disrupts the vibe. Another system was each Lenzmen kicking verses and the group choosing which one sounded best over the beat. Verses sounded great, but they just didn’t match up and every track was a bunch of freestyles. I realized that the only songs with full support were those tracks that everyone shined on and they were also about something. It’s not just a song with a main idea, it’s the songs that we wrote behind a concept and more importantly, we wrote together. That’s the gelling point. The Lenzmen became a rap group and although the spirit of competition is still there, songs couldn’t be allowed to suffer for the sake of individual shine. As a producer, it’s my job to make sure each Lenzmen sounds like the best version of themselves. Each Lenzmen has a responsibility to make sure the whole is greater than the sum of the parts. It’s appropriate that the album is called Bend and Blur Your Optics since the line blurred between the individual performance and the group dynamic. In an album context, much of this sentiment is lost since it’s about the entire body of work now. There’s enough material to get an overall sense of each vocalists potential. If I was asked which Lenzmen is the best? I’d say whichever had the mic in their hand. Enjoy Lenzmen album I: Bend and Blur Your Optics and make your own determinations. Head nod to Docktor Strange, Centri and Earthadox. 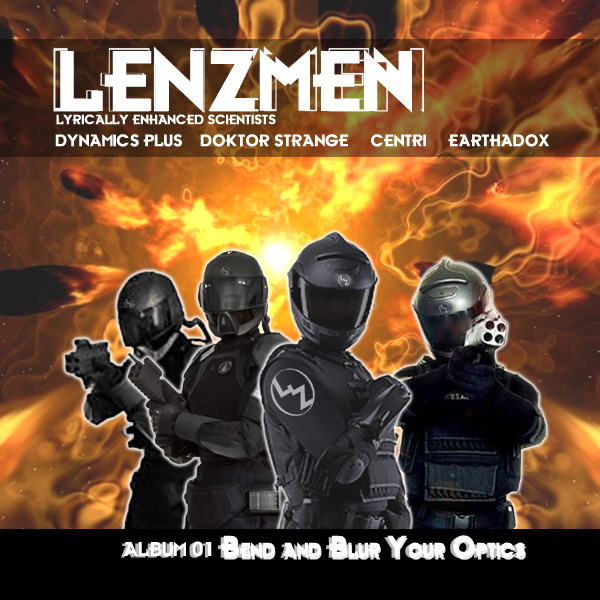 You can preview and purchase the Lenzmen Album I here. Also on iTunes, Amazon and other Digital Distributors. You’ve done a lot of risky choices in your career in the eyes of hip-hop audiences and have succeeded each time. Why do you feel there are such limitations that even “experimental artists” will have on their music? I think I’m only successful because I am driven by my own definition of success. I pride myself on being creative, different and highly lyrical. As long as people say that I hit the mark, I’m good on all other accounts. Obviously, I face all the same limitations of resources and exposure that all artists do. I take an extra hit for being so left field, but I’m not really an animal that enjoys running in a herd. I try not to limit my musical directions by what I think will sell or sell well. I can’t use mainstream media outlets like the radio or video channels to help decide what I should do next. That will always keep me in the box of experimental risk-takers. I’m fine with that since I only need enough exposure and $ales to justify putting out another record. I will always make music, but packaging an entire project and pressing it up takes a level of focus and commitment that still has to make sense and cents at the end of the day. Battlestrux: Captain of a Starship kind of grew out of nowhere. After Chaos Legion I and II, I felt like I had done enough stories for a while. I was ready to dive back into freestyle joints, but every so often I would finish another starship story and soon realized I had half an album done without really trying. So I decided to stay the course and finish off the album. Fortress of Solitude was pieced together very deliberately. 3 story joints, 3 freestyles, 3 songs etc…I picked songs from my raw-catalogue and rendered them. That’s where the “Interactive Construction Module” idea came from. I built songs like I was a scientist carrying out sonic experiments. Chaos Legion was basically a huge story arc and I wrote and recorded the songs in order. I basically lived out that adventure inside my studio. Starship was simply a matter of me saying “What happens next?” I wasn’t even sure what was going to happen at the end. The mission is to investigate some kind of anomaly that’s destroying ships in a gravity well. That’s it. I kept the plot real simple, but buried all the extra meanings so you can only get caught up in the layers if you choose to. Chaos required a keen level of perception to really get it all. So far, the feedback has been that Starship is much easier to follow and I think that’s because of the linear nature …in the order of the songs. There aren’t any diversions or side quests to get lost in. Character Voicing has been a big deal on a bunch of my story albums. Starship had a lot of different characters coming in and out and there are whole sections left to the ad-libbing characters to fill in. This definitely added to the challenge of pulling off an album with a huge cast of supporting personalities. In Chaos, I used the story to flesh out the personalities. In Starship, it’s all down to the ad-libs and what they choose to say that gives you the idea of how these characters would interact in different scenarios. It’s a double-edged sword. It’s much more cost effective to release music as MP3s than any kind of physical media. But the hitch is that it’s also much easier to obtain your music illegally and share it without any consideration. I see tons of Lenzmen songs as free downloads all over the net. People are even uploading scans of the physical CD like “Here, print this and make your own CD cover”. The peeps behind it are trying to spread the word and share our stuff, so where do I draw the line? I only hope someone gets an experience and likes it so much, they decide to support us on a future project and buy the music. One can hope, can’t one? The best part about digital distribution and sales is the tracking of sales through sites like iTunes and Amazon. I get to see exactly what songs are people’s favorites from any album. The songs that I consider the singles always do well, but every so often I get surprised by something I really made just for me being appreciated and selling as well. Thoughts on the relevant artist/groups of the 90′s still being dominant forces in the game …Nas, Jay-Z, Wu Tang..? I see the parallel in sports, mostly boxing. There isn’t a new crop of cats coming up with enough raw skill to push the veterans out the door. So it’s a situation where the old heads are schooling the new generation at every turn. If you build yourself on ‘hitz’ then it’s always possible to run out of big hit records and fade. The foundation for a long career is based on skill and the ability to adapt to the changing landscape. Skills diminish much more slowly and for many of veterans, the bar was so high, it’s going to take a long time to degrade down to the level where most of the newer cats are coming in at. And that’s only because the new generation of artists and athletes are built up by endorsements and hype as opposed to their raw talent and skill. Um…that’s a tough one. Maybe “Space Kraken Awaken”. It’s a self-contained story that really sets up the rest of the album. I like the traditional arrangement with a hook and bridge- something I usually try to avoid with story joints. I feel like a traditional format reminds you it’s a song and not a narrative, but in this case it works. Musically, it’s really out there and spacey without all the lazer zaps and filter sweeps. I feel the story captures some really special moments- like the engine room scene and the switch up to the bridge in the final moments. I feel like I’m right there when I hear this one. Yeah, it’s one of my favorites, for sure. One that hasn’t been made yet. We have so much more experimenting to do. Right now? All the Lenzmen are still active, so it’s really a matter of time. Pretty good -if we can figure out how to pull it together while we are all so far from each other. Centri has another full length album to follow up his Article 15 debut. Docktor Strange has his first solo album coming and Earthadox is building his studio and making music. So really, everyone has albums coming and I think after we get those out, it’ll be time to reconnect the continents. I’d like to finish off a bunch of planned releases. Doctor Atomics is certainly in my future and there are a good number of Story-based Universes that need to be fleshed out. More albums, more music, more abstract sci-fi hip hop! Hey, thanks for this interview Feenom. 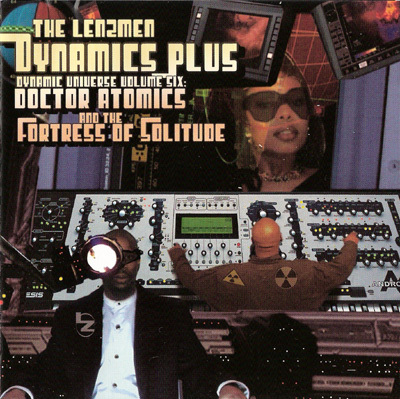 The album Doctor Atomics and the Fortress of Solitude , which I got directly from emcee Dynamics Plus, is the only album I have from them; I’ll eventually get the entire discography because this one album already shows me it’ll worth listening to even just once during my lifetime. IMO, Doctor Atomics and the Fortress of Solitude is pure talent in all directions that the mainstream and even the majority of the underground Hip-Hop/RAP world wishes it could be. Beyond ahead of their time lyrically. And to top it off their beats are so damn strange and catchy, I can’t help but let the track take me on whatever journey it wants to. “Entrance Verse” isn’t just your average entrance. It blasts off rhymes at speeds that my Ex-Thrash Metal playing ears have trouble keeping up with. I think it’s hilarious that they name such a funky beat and flow that has such an immense amount of rhymes in it just an “Entrance Verse.” Hilariously impressive. “Far Beyond Your Range” is one that sticks out to me in a big way. A change in swings on the drum pattern from the rest of the album up to that point – it’s a big half time feel, like the average Bone Thugs N Harmony beat, and I absolutely love BTNH. The lyrics are referring to cosmic events in the vacuum of Space and showing the beauty of it via Rhythm And Poetry. I love the concept and feel it was executed perfectly. I actually feel a tingle of inspiration listening to this track. I thank them for giving me that tingle. It’s probably my favorite track off the album. “Focal Point” is a lyrical assault with a flow that makes my brain explode. “Interactive Construction Module” is simply creative. I love it. A lot. “One Chance” lyrically destroys mythologies and other forms of imaginary being based fairytales. Even Christopher Hitchens would be impressed with the wordplay. Richard Dawkins, Sam Harris, and Daniel C. Dennett would probably drop a shout out during the filming of The Four Horsemen to Lenzmen if they knew this track existed. “STACI III Garden of Eden” is what I would consider pure evidence of versatility that Lenzmen posses when it comes to production, engineering, lyrics, and execution of lyrics. I can’t describe this one other than it has an intense vibe to it. And I love the beat; it has a Funky feel to it. I could strut down a cyber metropolis city block to this groove. Overall, I would say Lenzmen are fascinatingly talented and I would suggest them to anyone who is looking for Hip-Hop/RAP music that is “out there” from the everyday nonsense that is being spewed out of people’s faces. Listen to the album after the sun has set for that day’s rotation, because IMO it has a good night vibe. Keep it groovy. Because sometimes, it don’t mean a thing if it ain’t got that swing. You can read more from Anthony Michael Angelo on his Website http://www.rightsareimaginary.com/ and be sure to reach out to him on His Facebook page http://www.facebook.com/anthonymichaelangelo .